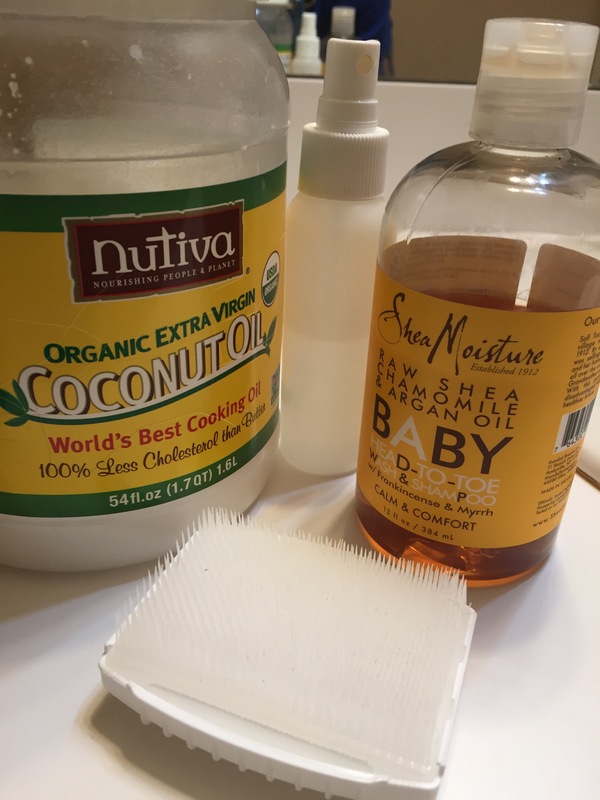 Pre-poo with about a dime-size amount of virgin coconut oil (VCO) a few minutes to a day prior to washing (whenever I get around to doing it!). 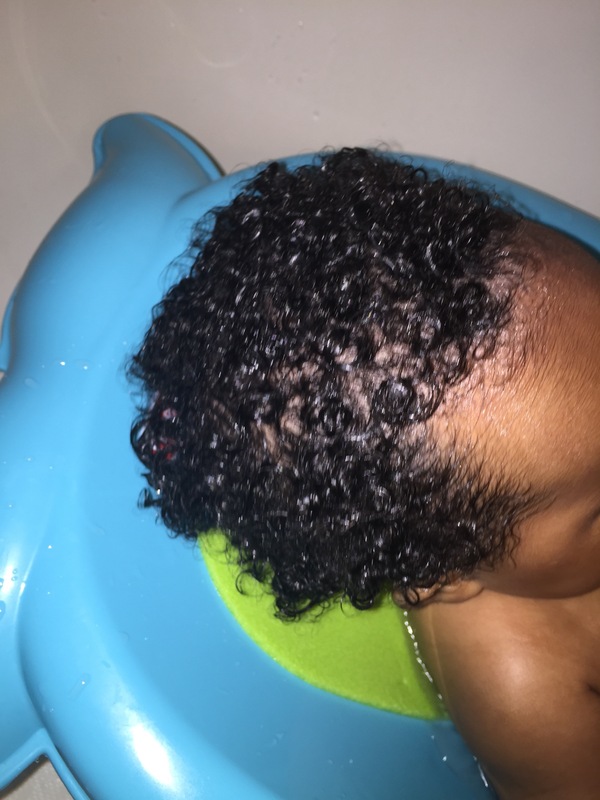 At bath time, dampen hair with water and brush scalp in a circular motion with Bean-b-Clean Cradle Cap Brush. MINI-REVIEW: This brush is like my shampoo brush that I love, but with very soft, flexible, and closely packed bristles. It really helped clear up the scaley, oily, build-up of dry skin on Wynn’s scalp. It wasn’t cradle cap, but think that might have developed if I hadn’t jumped on the issue when I did. 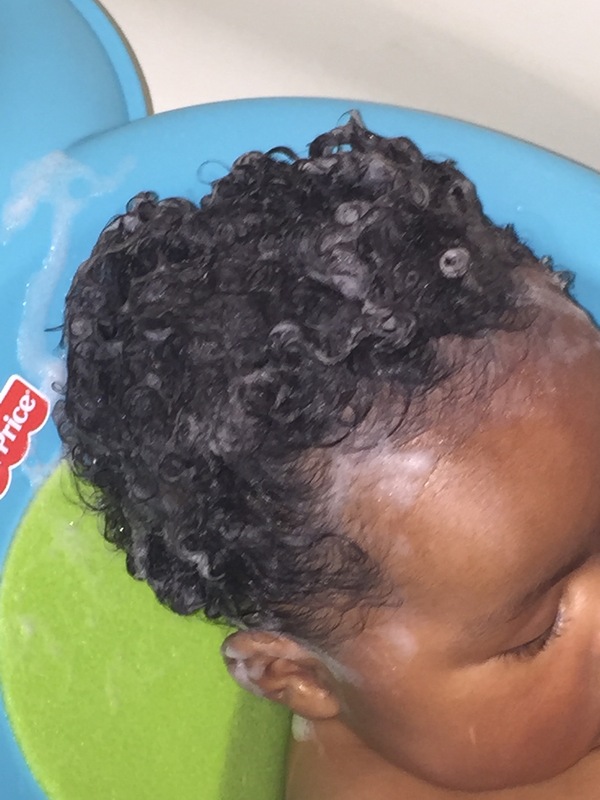 This brush is specifically made to treat and prevent cradle cap, so I use it every wash. Apply and lather Shea Moisture Raw Shea Chamomile & Argan Oil Baby Head-to-Toe Wash & Shampoo w/Frankincense & Myrrh. MINI-REVIEW: Man, that’s a mouthful, even for SM!! Whew!! Anywho, this was a gifted product and I love it! We use it as both her body wash and shampoo. It smells great, lathers and cleans well, but not too much, is gentle to baby girl’s skin and hair (non-drying), and doesn’t sting her eyes. Brush hair/scalp again in a circular motion with Bean Clean brush. Rinse shampoo with lukewarm water. Apply a small amount of VCO to damp hair. Apply a small amount of VCO with fingers. 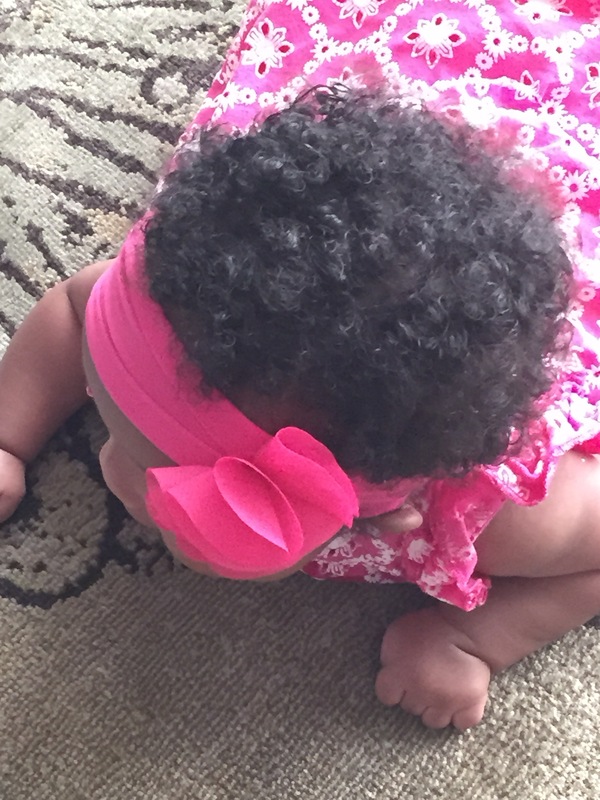 What regimen have you found work’s best for your mini’s ‘do? I see she has that whale tub. lol That must be the only kind they make these days. I remember it well. She has nice head of hair! And she is gorgeous! Although my mini-me’s are now 26yo and 30yo, LOL, I love the Shea Moisture baby line for myself! The raw shea and argan butter saved my skin this past winter and it is now an HG. I use the same SM baby wash for my shower and I highly recommend it to others (have not used it for a shampoo yet – must try!) I use the SM frankincense and myrrh facial moisturizer too. They are affordable, high quality products! Treat yourself and your mini me to these wonderful products! I definitely am grateful to have learned about so many natural alternatives over the last few years and to have access to such a wide array of products that weren’t around when K was a baby.